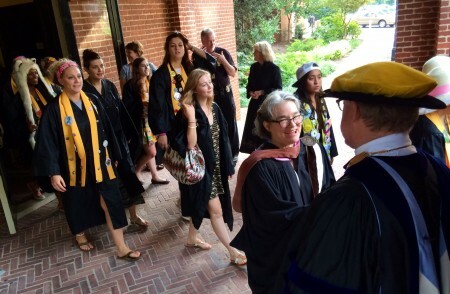 The Randolph College community celebrated the official beginning of the 2014-15 academic year with Convocation Tuesday. The ceremony began with the traditional procession of faculty and seniors into Smith Hall Theatre. To the cheers of the attending faculty and staff, seniors wore their traditional funny hats and graduation robes decorated with buttons as they exchanged cheers and songs with the sophomores. Carl Girelli, vice president for academic affairs and dean of the College, announced several awards for students and faculty. Sarah Woodward ’16 and Lindsay Brents ’16 earned the Phi Beta Kappa Book Award, which is given annually to the juniors who have attained the highest grade point averages in their class. Peter Sheldon, a physics professor, received the Kathryn Graves Davidson Award, which honors a faculty member who has brought distinction to the college. Kathy Muehlemann won the Kathryn Graves Davidson Scholarship Award to honor her work in curating the 103rd Exhibition of Contemporary Art, “”, which will be on display at the Maier Museum of Art at Randolph College this fall. Biology professor Adam Houlihan was awarded the Gillie A. Larew Award for Distinguished Teaching. Evan Smith ’15, the president of Student Government, welcomed the crowd and encouraged his fellow students to build community by accepting one another. He began by explaining the way membership in the Randolph College community changed him personally by helping him develop courage as people befriended him. “Through acceptance, this community has empowered me in ways I did not know possible,” he said, adding that empowerment is an important part of the College’s mission. After commenting on the happy feeling evident in the room, Bateman reminded the students that the academic year is beginning in what seems like a dark time in human history when violence from international wars and racial strife dominate headlines. “What we see when we look at the news is what the first century philosopher Seneca referred to as ‘humans making wasteful use of humans,’” he said. The answer to those question depends on how students engage with the material they discuss in class. Simply taking courses to earn a liberal arts degree is not enough, but it must be coupled with critical self-reflection, he said. A significant part of their education also depends on how students learn as they live together in a close-knit community, Bateman said. He described the College’s Honor Dode and how the most cited benefits of it include self-scheduled exams and the freedom to leave personal belongings in public places without fear of them being taken. The meaning of the honor code means more than that, he said. “I don’t mean to say that these are small achievements, but I would like to finish today by pushing you further and asking you to think seriously about what it means to live honorably in an even fuller sense,” he said. Bateman said honorable living should motivate Randolph students to create a community free of intolerable behavior such as sexual assault, the use of anonymous social media accounts to spread hateful messages about others, and racism. He told the students that their relationships with each other and with the College’s faculty and staff will give them the opportunity to develop honor. “You will have a chance, as we say in our mission statement, to learn how to live an honorable life,” he said.